Hot-stamped lettering is recessed into the surface and in black (H-series) or clear (C-series) only; our raised-letter caps cannot be stamped. Also, stamped lettering can be done only in two straight rows; circular lettering is not available. Hot-stamped caps are available with tapered shanks for pipes or rebar. Black letter hot stamping for pipe or rebar. Their tapered shanks allow them to be driven into the ends of pipe as well fit over rebar. Our C-series clear letter markers are the same as our black hot stamped (H-series) markers, except that the lettering is the same color as the cap. The clear letters are recessed into the surface. Letter counts are the same as H-series. Lettering is available in two straight lines only. All these features and remarkably low, factory-direct prices, too. Satisfaction guaranteed. Dealer inquiries are welcome. 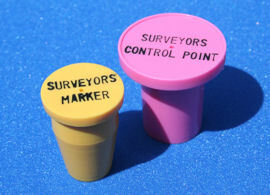 For job identification, survey markers and even advertising giveaways. Raised lettering. Available only for previously produced artwork only.